I had one lone bunch of collard greens growing in my garden and, as much as I hated to do it, I had to pull them to make room for my spring veggies. The collards were so pretty and tender and green, I didn’t just want to saute them with garlic – my standard go-to side dish for greens on busy evenings. Why not stuff them and make them the main course? These baked stuffed collards were delicious! A big hit with the kids and the husband. And super easy. For these baked stuffed collards, I decided to use chorizo. I have a small chorizo addiction. I use it in everything. If you don’t share my love of chorizo, use ground beef or any ground meat you prefer! Just know that chorizo packs so much flavor, it means less work for you when it comes to seasoning! If you use a plain ground beef or something similar, you might need to kick up the flavor on your own. These baked stuffed collards require a quick blanching of the collard green leaves and some precooking of the chorizo and rice. Three simple tasks that can all be done ahead of time! 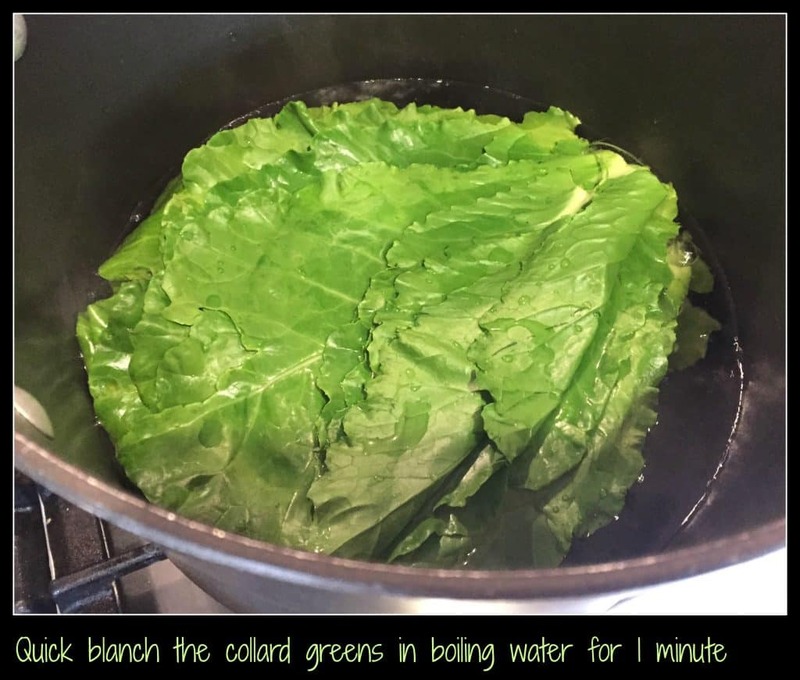 After you blanch the collard greens, let them cool for a few minutes so they are easy to handle. 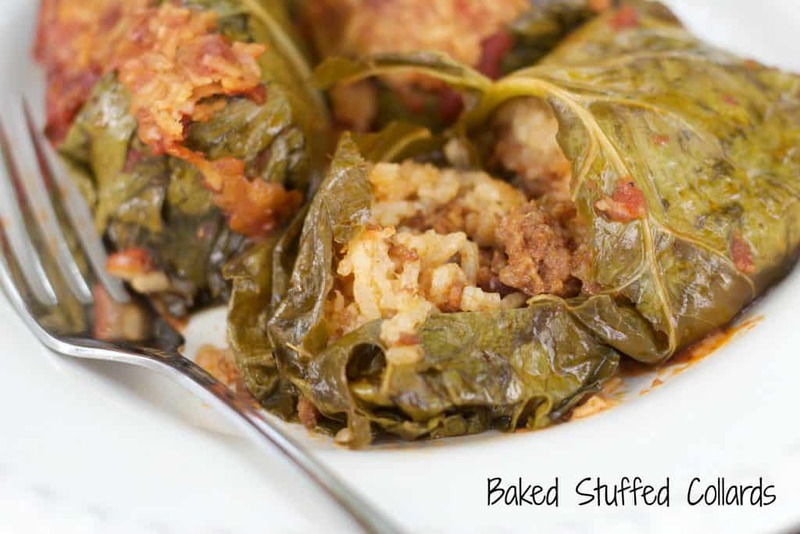 Put a couple of tablespoons of the chorizo and rice filling on each collard green – smack in the center. Fold over the sides and then roll tightly – kind of burrito style. 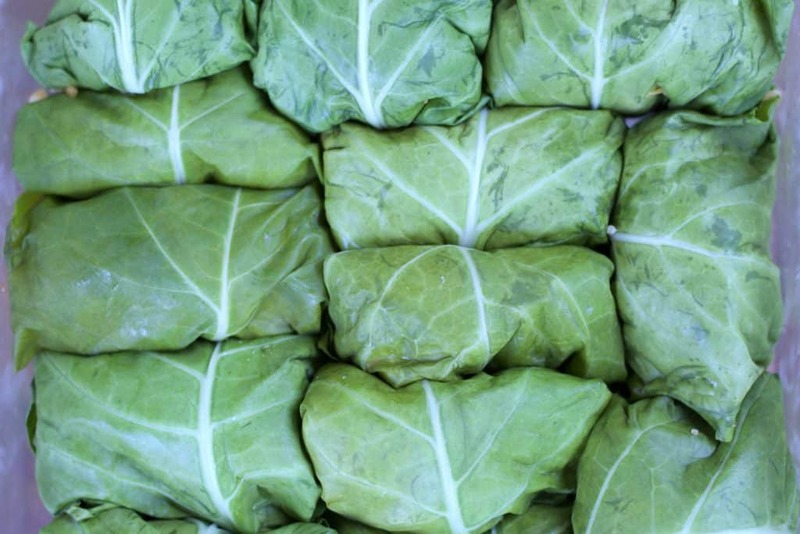 Place the “seam” of the stuffed collard green down and pack them in one after the next in an 8×8 pan. Baked stuffed collards – deliciousness. To finish off your baked stuffed collards, ladle a simple marinara sauce over the top of all the stuffed collards and then sprinkle with additional cheese. That’s it. Cook at 350 degrees for 20 minutes and you’ve got dinner ready! We served our baked stuffed collards with a fresh arugula and radish salad. This meal is great to make ahead and then pop in the oven when you walk through the door. Because everything is precooked, the baking time is only needed to bring all the flavors together and melt the cheese. Enjoy! Five ingredients or less! 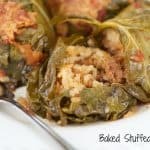 These baked stuffed collards are easy and delicious! Boil a pot of water large enough to cover the collard greens. 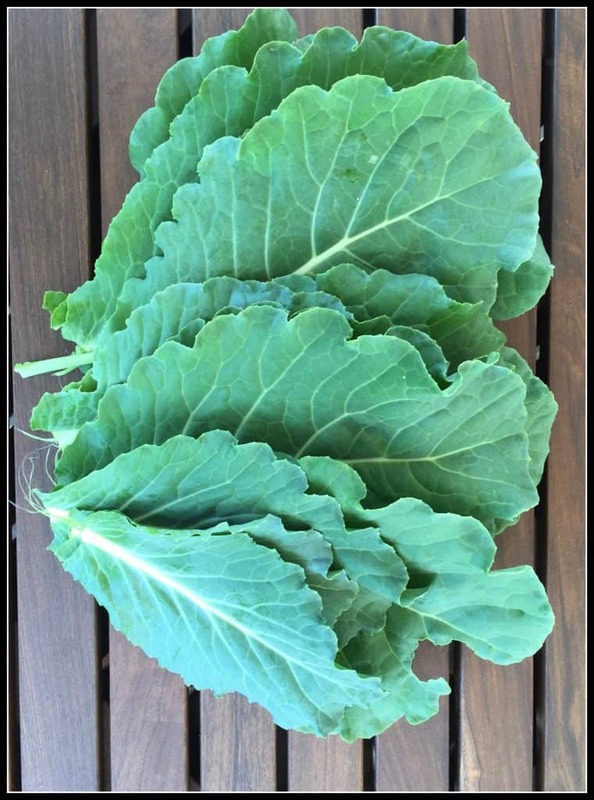 Drop the collard greens into boiling water and keep in the hot water until they are bright green and very soft. Remove from the water. Drain. Combine cooked rice and chorizo. Add about 1/2 cup to 3/4 cup shredded cheddar cheese. Lay out one collard green. Spoon 2 to 3 tablespoons or so of chorizo and rice and cheese onto the center of the collard leaf. Fold the sides over the filling and then fold over the ends so the filling is neatly contained inside. Place the filled collard, seam side down in an 8x8 pan. Repeat for the remaining collard greens. Pack the stuffed collard greens together in the pan. Ladle 1 1/2 to 2 cups of your favorite marinara sauce over the stuffed collards. Collards is one of my fave veg here. great for stuffing or just stir fry. Your stuffed collards absolutely looks winner! Thanks, Citra!! I love to stir fry them, too! Such a smart trick to use collard leaves as the envelope, and your simple filling sounds just perfect! Pinned! What a great idea! I love collards, but I never thought to stuff them. I recently had a random craving for my mom’s stuffed cabbage rolls I grew up with… I may have to make these instead! I have never had stuffed cabbage rolls but we did have stuffed peppers! Such comfort food! Oh yum! My husband and I love collard greens and we also love cabbage rolls. I don’t use rice in mine however, just beef, fire-roasted tomatoes, onions and spices. I cook mine on top of the stove in beef broth. I have never done them in the oven. I am so gonna fix some stuffed collard greens with chorizo. OMG, this sounds amazing!